Haha Ysh, I scored very very similar to you! 😀 I meant to look into this a while back but then forgot about it – definitely a post for later this week now, cheers! This was an interesting profile, that I remembered taking some time ago, probably version 1. I found the diagram could skew very dramatically based on how enthusiastic your declaration for a particular preference was, https://goo.gl/N3Kz9T (or conversely, how much you hedged, https://goo.gl/RVZGa5). The general directions of the axes did a decent enough job indicating relative preferences though. 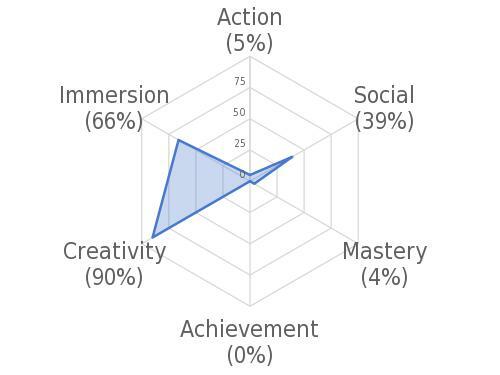 I liked the Ars Technica link, you could see very strong deviation in motivation preferences there, I suppose they’re all gamers in a more general sense and play different types of games, as indicated by their top 3 favorite games.